Andover Corporation in Salem, New Hampshire has joined the list of high-tech companies turning to renewable energy to meet the intensive cooling demands of their business operations. Instead of turning to the familiar solutions such as solar or wind turbines, Andover dug deep, more specifically one thousand feet deep, to install a new type of geothermal cooling system. Andover produces ultra-high resolution optical imaging systems for satellites as well as other sensitive optical instrumentation, a process which requires energy-intensive cooling equipment. 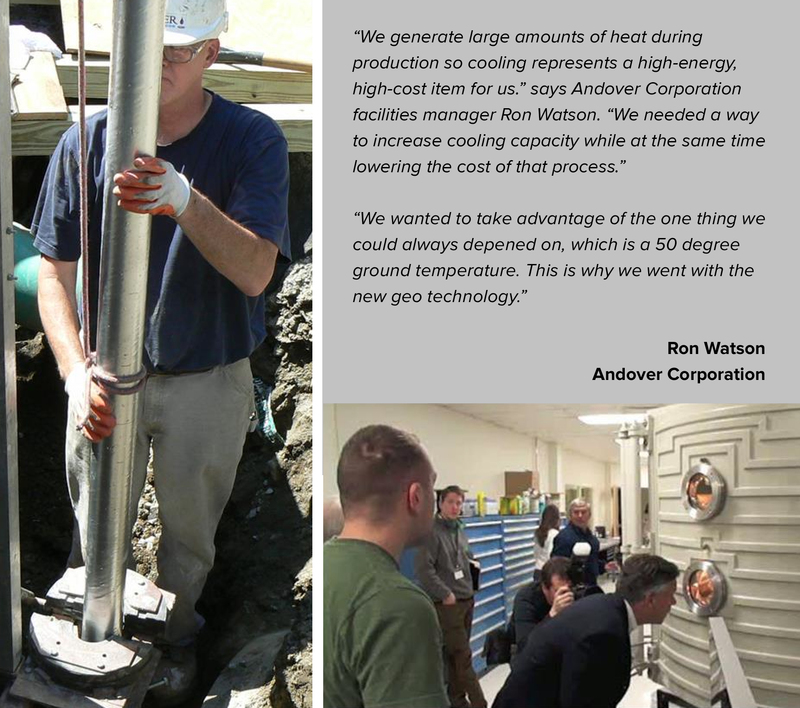 “We generate large amounts of heat during production so cooling represents a high-energy, high-cost item for us.” says Andover Corporation facilities manager Ron Watson. “We needed a way to increase cooling capacity while at the same time lowing the cost of that process. We studied the approaches of cooling intensive industries like IT and data centers before deciding on our solution. We wanted to take advantage of the one thing we could always depend on, which is a 50 degree New England formation at 1000′ down. This is why we went with the new geo exchange technology. Andover utilized a special composite-based ground heat exchange system developed by Rygan Corporation of Tulsa, Oklahoma to offset the energy demand of cooling. The Rygan system has been in commercial use around the country since 2008, but is recently becoming adopted for more cooling specific applications. The composite-based ground heat exchanger has low thermal resistance which enables a more efficient heat exchange with the cool New England ground. Heat pumps are never directly exposed to ground water in closed systems and submerged pumps aren’t necessary – a distinct advantage for maintenance. The drawback is they aren’t as efficient. The plastic piping protecting the system from ground water minerals also insulates it from thermal energy. More loops must be drilled to overcome the insulation increasing land space requirements and cost. The recent technological advancements haven’t escaped one of the world’s largest engineering and environmental companies, AMEC (London Stock Exchange:AMEC). With over 27,000 scientist and environmental engineers, AMEC has a global presence and is an established leader for geothermal based designs that incorporate smart technologies. Sr. AMEC Project Manager, John Peterson partnered with Reidar Bomengen in utilizing Rygan technology on both the Longfellow House and Olmstead National Park. Reidar Bomengen installs thousand foot deep Rygan ground heat exchangers for the Andover corporation who manufature high-tech optical equipment for satellites. The new geo-based system cools the heat intensive production process at a fraction of the cost of the older chiller system.